August was so full of climate news that the 'Leading Edge' took a step back from the edge on one critical subject, Net Primary Production (NPP). This is to ensure NPP is highlighted in this September report. The InterAcademy Council (IAC) is a multinational organization of science academies created to produce reports on scientific, technological, and health issues related to the great global challenges of our time, providing knowledge and advice to national governments and international organizations. Sound scientific, technological, and medical knowledge is fundamental to addressing critical issues facing the world today. The Committee found that the IPCC assessment process has been successful overall. However, the world has changed considerably since the creation of the IPCC, with major advances in climate science, heated controversy on some climate-related issues, and an increased focus of governments on the impacts and potential responses to changing climate. A wide variety of interests have entered the climate discussion, leading to greater overall scrutiny and demands from stakeholders. The IPCC must continue to adapt to these changing conditions in order to continue serving society well in the future. The Committee’s key recommendations for improving IPCC’s assessment process are given below. Recommendation: The IPCC should develop and adopt formal qualifications and formally articulate the roles and responsibilities for all Bureau members, including the IPCC Chair, to ensure that they have both the highest scholarly qualifications and proven leadership skills. Recommendation: The terms of the Working Group Co-chairs should be limited to the timeframe of one assessment. Recommendation: The IPCC should redefine the responsibilities of key Secretariat positions both to improve efficiency and to allow for any future senior appointments. Recommendation: The IPCC should develop and adopt a rigorous conflict of interest policy that applies to all individuals directly involved in the preparation of IPCC reports, including senior IPCC leadership (IPCC Chair and Vice Chairs), authors with responsibilities for report content (i.e., Working Group Co-chairs, Coordinating Lead Authors, and Lead Authors), Review Editors, and technical staff directly involved in report preparation (e.g., staff of Technical Support Units and the IPCC Secretariat). IPCC’s management and governance structure is not as effective as necessary to manage a larger and more complex assessment and to respond to a larger and more demanding group of stakeholders. The modified structure proposed for the IPCC by the Committee retains the decentralized structure, which is a key to IPCC’s continued vitality and authority, but adds flexibility and strength to its administrative support function. Because the individuals involved in the IPCC assessment process carry the burden and responsibility of maintaining the public’s trust, it is important for all involved to act with transparency and integrity and to abide by appropriate codes of conduct. Public trust in science also depends on effective communication, and there are many opportunities to enhance the usefulness of IPCC assessments as tools for informing policymaking and public discourse. Methane is often discussed when examining mass extinction events in earths history. Understanding methane in the context of our current human induced climate change will help us understand potential consequences from our current radiative forcing. Rodolfo del Valle and his team are heading to the Southern Ocean to conduct a three year study of a notable region where methane release is now observed.The three year study of methane release in the Erebus and Terror Gulf, a remote spot off the Antarctic Peninsula, will help increase understanding regarding methane release as global warming advances. 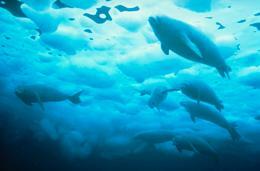 Methane could be implicated in deaths of crabeater seals in the area. 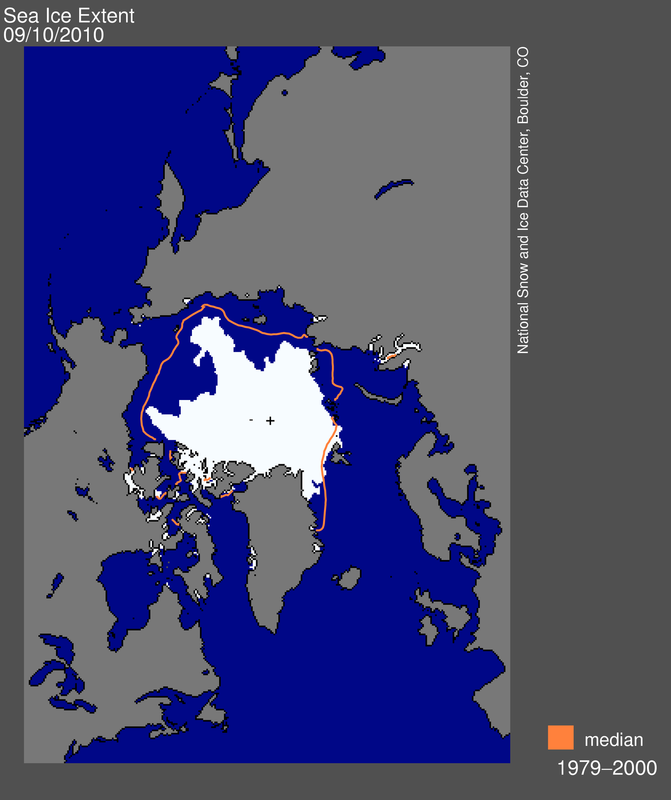 On September 10, 2010 sea ice extent dropped to 4.76 million square kilometers (1.84 million square miles). This appears to have been the lowest extent of the year; sea ice has now begun its annual cycle of growth. The 2010 minimum ice extent is the third-lowest recorded since 1979. The 2010 minimum extent is 240,000 square kilometers (93,000 square miles) above 2008 and 630,000 square kilometers (240,000 square miles) above the record low in 2007. This is 340,000 square kilometers (130,000 square miles) below 2009. The 2010 minimum is 1.95 million square kilometers (753,000 square miles) below the 1979 to 2000 average minimum and 1.62 million square kilometers (625,000 square miles) below the thirty-one-year 1979 to 2009 average minimum. Figure 1. 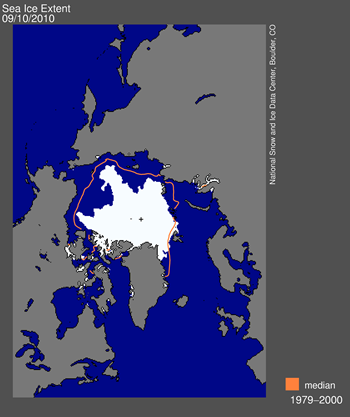 Daily Arctic sea ice extent on September 10, 2010 was 4.76 million square kilometers (1.84 million square miles). The orange line shows the 1979 to 2000 median extent for that day. The black cross indicates the geographic North Pole. Sea Ice Index data. About the data. MONCKTON resorts to ad hominem styled/inferred attacks by employing red herring diversions in what seems to be a desperate attempt to show his opinion is somehow superior to the scientific understanding, evidence, observations, physics and mathematics that support the scientific consensus that shows that humans are in fact influencing the climate and causing global warming. The overall effect is simply that Monckton is further revealing that he does not have the science on his side. By attacking the scientists rather than the science he further proves that he does not have any relevant argument.